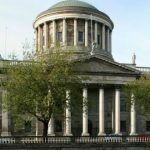 McMahon & Williams represented an individual who was refused entry into a Bar & Restaurant in Dublin with her assistance dog. The individual who is a wheelchair user relies on her assistance dog to assist with every-day tasks. 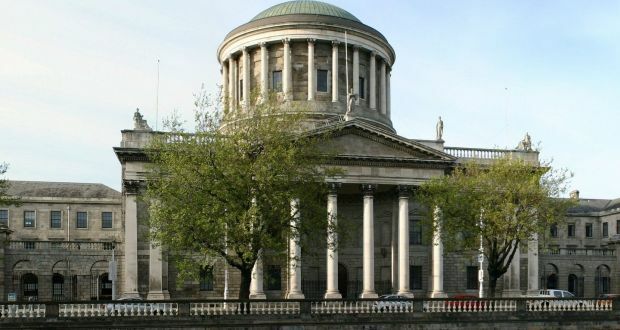 McMahon & Williams Solicitors proceeded with a claim under the Equal Status Acts on behalf of the individual. Before the case came to hearing, a settlement was agreed in which the claimant was awarded damages as well as having their legal fees covered. A donation from the award was made to the charity. 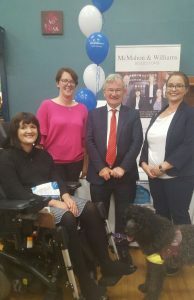 This follows the landmark case taken by McMahon & Williams Solicitors on behalf of a child with cerebral palsy who was excluded from school because of his assistance dog. This was the first case in Ireland that used equality legislation for a child with an assistance dog. 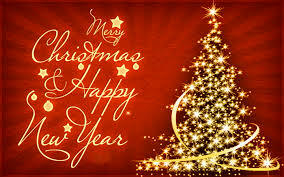 Gearoid, Sinead and all the staff at McMahon & Williams would like to wish all our clients and colleagues a very happy and peaceful Christmas and good wishes for 2018. 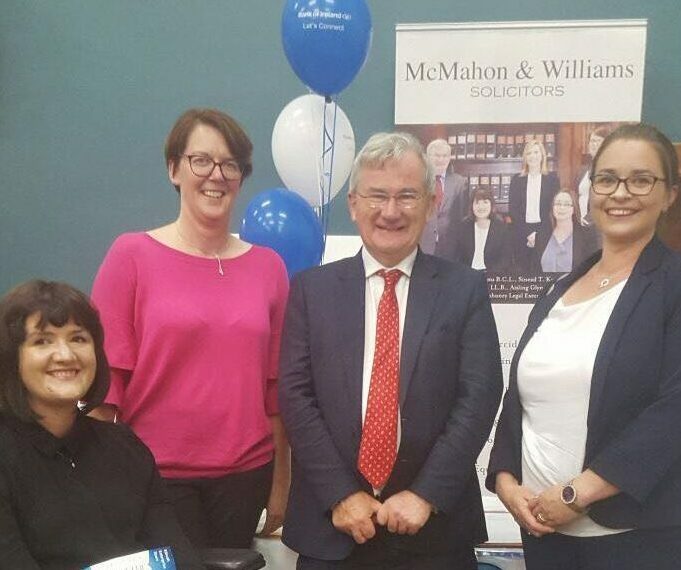 McMahon & Williams Solicitors were delighted to take part in a fantastic event last Friday at Kilrush Community School; Kilrush Enterprise Town hosted by Bank of Ireland. Over 100 businesses turned out to showcase all of what Kilrush has to offer. Thanks to Minister Pat Breen and Gavin Duffy for stopping by! Well done to everyone involved. Friday the 23rd of June last was ‘Bring Your Dog to Work Day’. However, here in McMahon & Williams every day is bring your dog to work day. 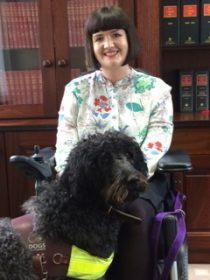 Our colleague Aisling Glynn, Solicitor is pictured with her assistance dog Gina. It’s difficult to believe that over a year has passed since Aisling first brought Gina to join us at McMahon & Williams. 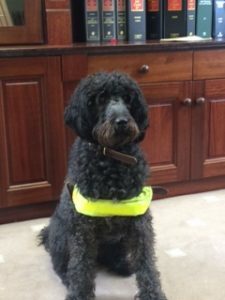 Gina was specially trained by the charity, Dogs for the Disabled and helps Aisling with everyday tasks such as calling the lift, opening and closing doors and retrieving dropped items, to name but a few of her many talents! McMahon & Williams represented an individual who suffered severe stress as a result of bullying and harassment in the workplace. This individual was the victim of a campaign of bullying and harassment that led to serious psychological injuries. A claim for personal injuries was brought to the High Court by McMahon & Williams Solicitors resulting in a substantial award of damages. The claim was settled outside of court. McMahon & Williams represented a lady who suffered serious injuries to her back and neck as a result of being rear ended in a road traffic accident two years ago. McMahon & Williams successfully achieved a substantial settlement for this lady in March 2017, without the need to go to court. 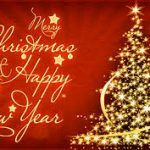 We at McMahon & Williams Solicitors would like to take this opportunity to wish all our clients a very prosperous and Happy New Year. 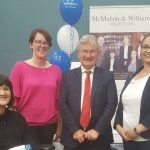 McMahon & Williams Solicitors recently took part in ‘Best Will Week’. 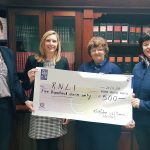 The proceeds of this were donated to a very worthy organisation, Kilrush RNLI. Two of our Solicitors, Sinead Kenny and Ciara Comerford present a cheque for €500 to Pauline Dunleavy and Therese Young of Kilrush RNLI. The Book of Quantum is a general guide as to the amounts that may be awarded for personal injury claims. It acts as a guide in respect of specified types of injuries. If you require any further information in relation to the Book of Quantum or personal injuries matters, please contact either Aisling Glynn or Sinead Kenny of this office. 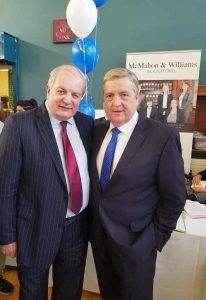 McMahon & Williams are delighted to take part in Best Will Week 2016. 70% of Irish adults have not made a Will. Making a Will gives you an opportunity to ensure that proper arrangements can be made for your family and gives you an opportunity to distribute your property in a way that you wish. During Best Will Week, MyLegacy.ie aim to encourage Irish people to make a Will and to support a charity through doing so. Contact us during Best Will Week to make an appointment for a Will consultation. 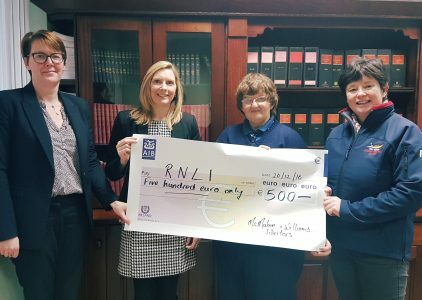 This year McMahon & Williams Solicitors have decided to donate the proceeds to Kilrush RNLI.